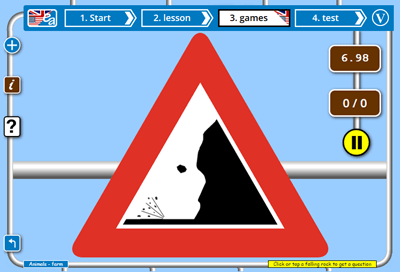 Using games to learn ESL was once a radical concept but with the advent of kinasthetic learning ideas, they have proved very popular with teachers seeking to make their lessons more interesting. 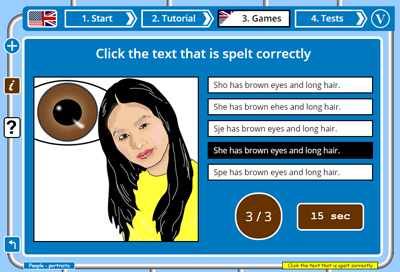 Our ESL EFL learning games are designed for individual learners to play in order to reinforce language learned in a more structured context. 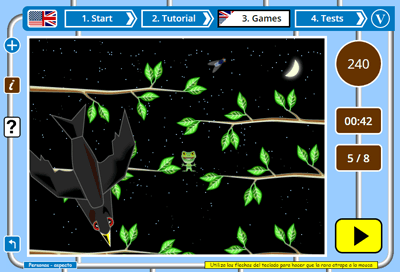 The frog flies - learn English with the little frog! If you need help while playing a game, click on the '?' button on the left pole. The help box for the game will display automatically. 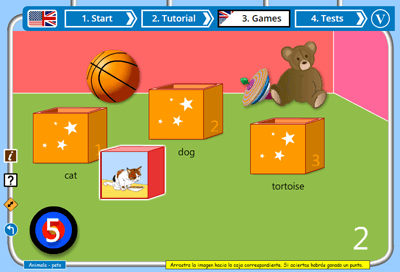 A child's playroom needs tidying up - put the picture blocks into the correctly labelled box to score points and clear up the room. 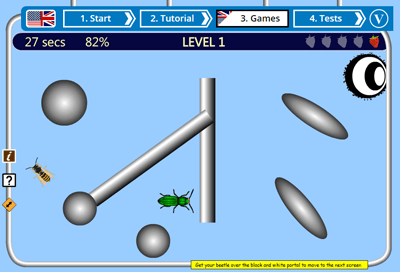 Simple game with nice graphics suitable for children as young as 5. Match items of vocabulary to the correct picture to clear these cells revealing a large picture previously hidden by that content. Pelmanism is an age old favourite with language teachers and students alike. 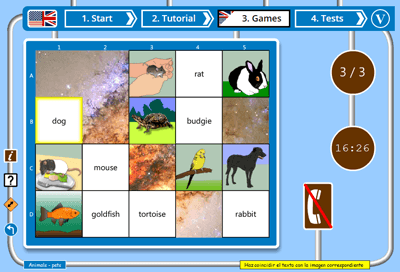 Win 4 cells in a row by matching the cell's picture to the correct item of vocabulary in the list. A quick game you can work through in a minute - also good for hearing the audio for all the vocabulary in the topic. Guess the item of vocabulary letter by letter from the on-screen keyboard - wrong guesses add pieces to the gallows being built on the beach. Great for reinforcing the spelling of words and emphasising the position / occurence particularly of accented letters in some English words. 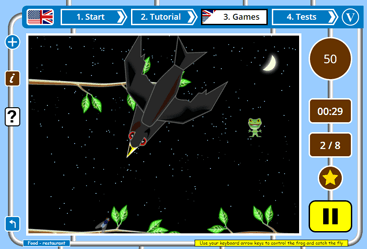 Use your keyboard arrow keys or tap your tablet screen to control the frog and catch the flies. Avoid the birds! Answer the questions to win points - you have 5 seconds only... 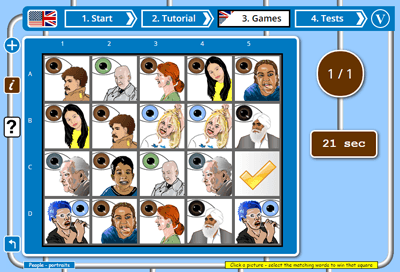 Scoring is based on speed and the number of correct answers. Fast game, can be paused! 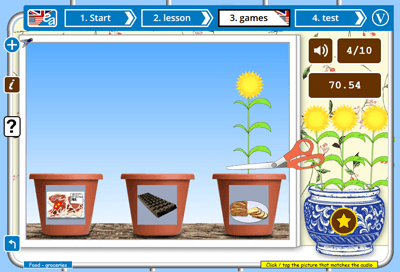 Test your audio skills by clicking on the right picture for the spoken language - correct answers win sunflowers; the aim of the game is to fill the vase with pretty flowers - high scores leaderboard and bonus points available. Listen carefully! You see a set of pictures - for each picture you are offered 5 similar texts but only one of them is a correct spelling of the words related to that picture - click the right spelling to win a point. Timed game.